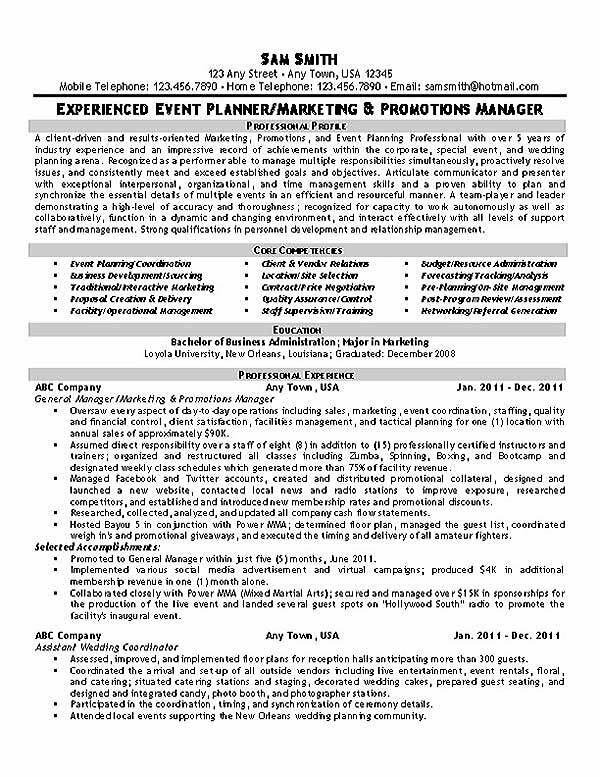 The resume uses a headline statement to identify the target in event planning, marketing and promotions. The professional profile is written in an executive summary style. The job candidate highlights experience planning events in corporate, special events and weddings. Through the summary and core competencies section the job seeker emphasizes personal traits that make them ideal for this position. The main skills include managing multiple tasks, problem solving, organization, interpersonal communications and coordination. Other job related experience including business development, client / vendor relations, budgeting, site management, forecasting, staff supervision and quality assurance. The job experience section goes on to explain specific experience at each position written in reverse chronological order. Each job has selected accomplishments that highlight real action driven events that prove to the reader that the job seeker has been successful in the past. The resume concludes with past unrelated work history, designations, training and community involvement. Creative and dedicated professional with expertise in the planning, coordination and execution of large scale corporate events. Acknowledged for creating elegant and professional conferences, banquets, executive meetings and promotional events. Hard working, detail oriented, self motivated professional capable of organizing multiple tasks simultaneously while reaching stringent timelines. 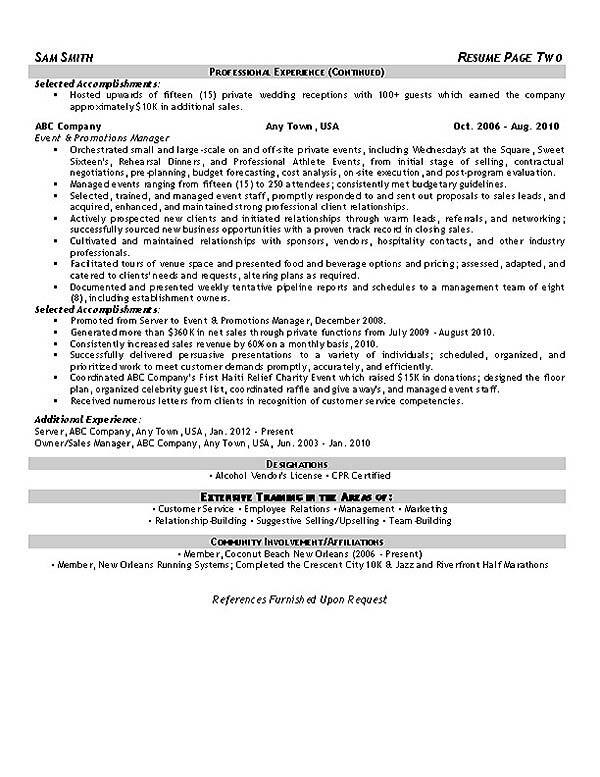 Articulate, approachable and people-oriented individual that excels at relationship building and vendor management. Negotiated long term cost saving contracts for food / beverage catering and decorations. Set up facility, organized design team, arranged music, scheduled speakers and created invitations. Managed trade show presentation including design of marketing materials and organization of travel / accommodations.